No one wants to lose to the Phoenix Suns and that's precisely what the Oklahoma City Thunder did on Sunday night. Phoenix (6-26) hosted the Thunder (22-18) and took full advantage of their opponent not having it's best perimeter defender on the court, defeating OKC 114-100. With Andre Roberson out during this road trip, the Thunder gave up 117 points to the Clippers in a winning effort and 114 on Sunday. Phoenix executed backdoor cuts to perfection and caught OKC lounging around on numerous occasions. Paul George is an exceptional defender but neither he or Roberson is as effective without the other. Roberson has been suffering from an injury for the last few games, ruling him out in Phoenix as well. Subsequently, Phoenix went to town. Their ace, Devin Booker erupted for 26 points on 5-of-10 shooting from three and on the other wing, TJ Warren scored 23 on 9-of-15 shooting. Those two players would've been primarily defended by Roberson and George throughout the majority of the contest and presumably wouldn't have had the performance that they had. On Phoenix's coaching staff did a phenomenal job of capitalizing on OKC's shortcomings. If that wasn't enough, Drogan Bender and Josh Jackson combined for 37 points off the bench on 9-of-14 shooting from three. 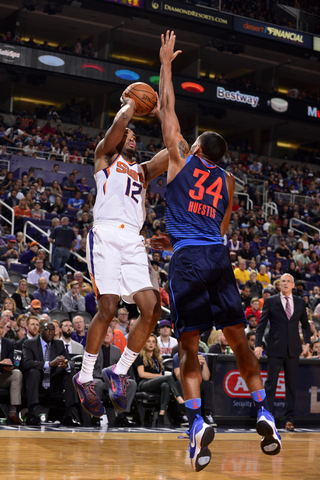 Overall, the Suns looked like the Houston Rockets, shooting 17-of-39 from long range. The Thunder weren't focused tonight. They had a great time in Los Angeles this week and it showed. Forfeiting those 37 combined points to two bench players, one of which a rookie, that only average a combined 14.6 points per game is inexcusable. Giving up on multiple backdoor cuts is also inexcusable for an experienced team like the Thunder. There were a few other things that ailed Oklahoma City tonight, including turnovers to start the game and second-chance points for the Suns following offensive rebounds. Oh yeah, and missed free throws. OKC shot 57.1 percent from there. The telling story and brutally honest truth about this Thunder teams seem to be that they don't play well against lesser opponents. Their record against teams that aren't considered to be in playoff contention is (9-9), yet their record against expected playoff teams is (13-9). More importantly, the Thunder have been getting the job done as of late with a (10-4) record since December 13th. Seven of those 10 wins came against playoff teams and three of the four losses came against non-playoff teams. Low performance against sub-par teams is the trend of this Thunder team and it may be something fans have to deal with. Fortunately for Oklahoma City, when it all matters - in the playoffs, they will only play playoff teams and that's something they seem to do well, as unorthodox as that may be. When Oklahoma City starts playing poor basketball consistently against these playoff teams, this can be deemed an issue but for now, it's not worth pondering on. Tuesday night they'll get another shot at a suspected playoff team, the Portland TrailBlazers that have notoriously been an obstacle for them. There's no say whether or not Roberson will be playing but if not, it'll be a tall order for this Thunder defense to hold back Portland's offense.